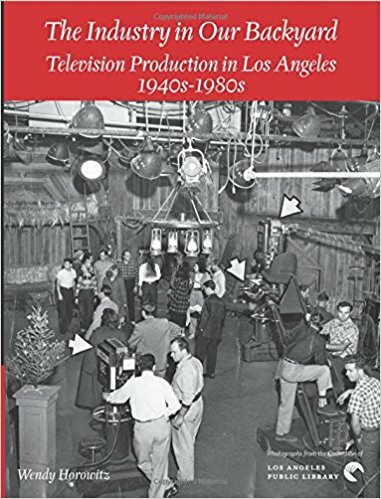 Born in Louisiana in 1922, Rolland J. Curtis came to Los Angeles with his wife in 1946 after serving in the Marines during WWII. 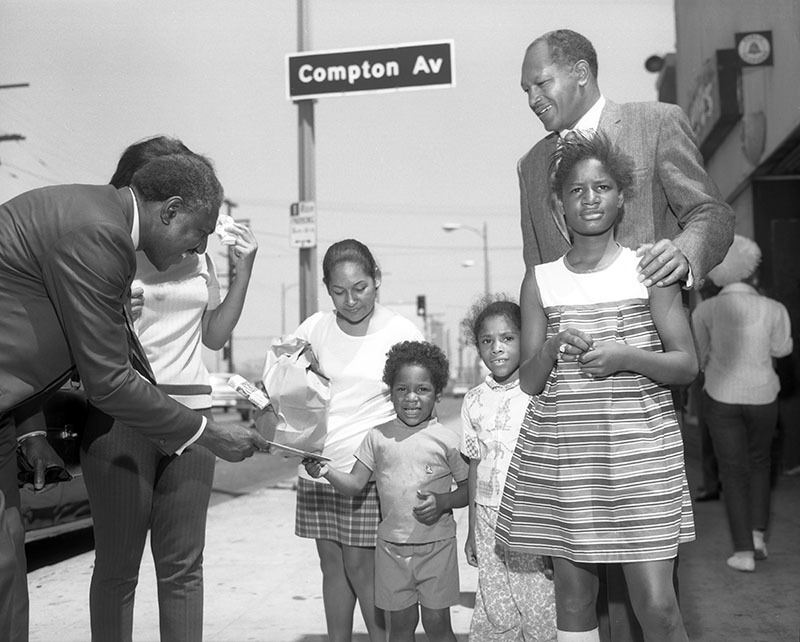 He worked as an LAPD officer for four years before attending USC where he played football and obtained the nickname “Speedy.” After earning a Bachelor’s degree and then a Master’s degree in Public Administration, Curtis ran a filling station with a friend before becoming Field Deputy to City Council member Tom Bradley. 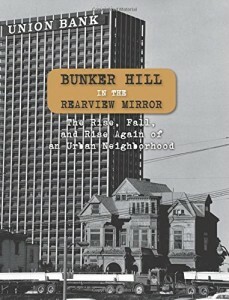 In 1967, he became the Field Deputy for City Council member Billy G. Mills. 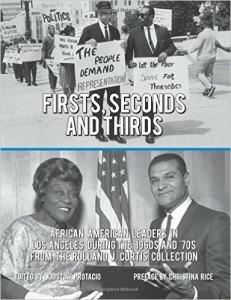 Bradley and Mills were two of the first African-American men to be elected to the Los Angeles City Council (with Bradley later becoming the first black mayor of Los Angeles) and Curtis (also African-American) served them proudly, assisting constituents, interacting with government agencies, and attending community events – always with camera in hand. 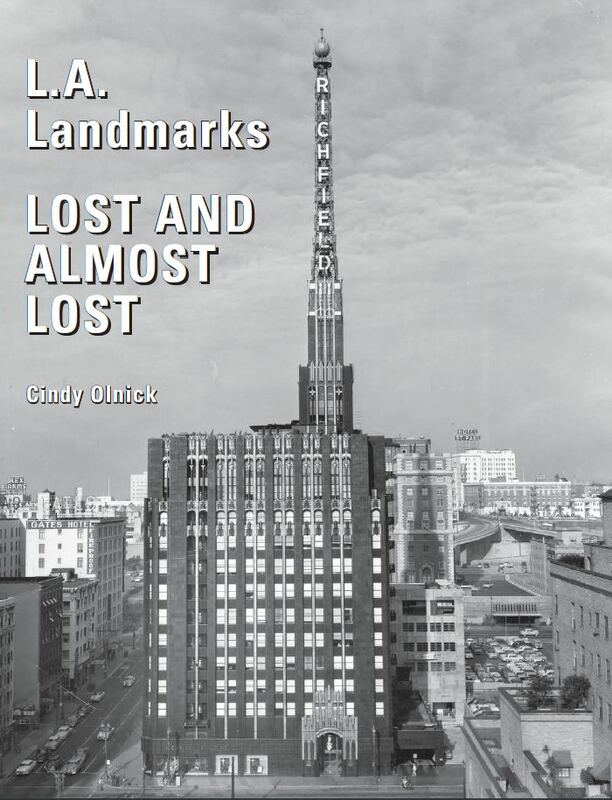 Curtis served as Mills’ Field Deputy until 1973 when Mayor Sam Yorty made him director of the Model Cities program, a comprehensive five-year plan to address the social, economic, and physical problems of poor and underserved neighborhoods using public and private resources. 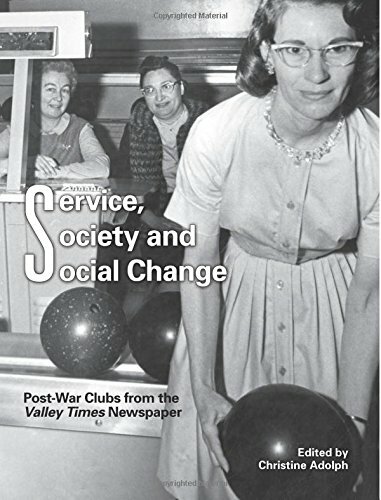 Curtis resigned from the Model Cities program in 1974 and opened a publicity shop. 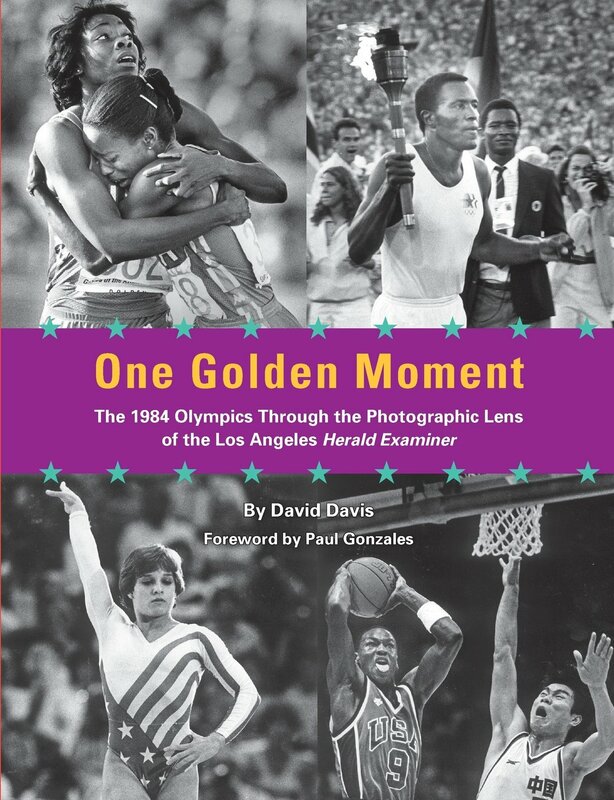 He later began working for Billy Mills again, remaining on the councilman’s staff until Governor Ronald Reagan appointed Mills to the California Superior Court. Curtis ran for Mills’ vacant council seat but was defeated. He ran a second time (in 1978) but was defeated again. On Mother’s Day in 1979, Curtis spent his morning delivering Mother’s Day bouquets to mothers in his community. He then returned home while his wife, Gloria, remained at a Mother’s Day celebration. When Gloria entered their home later in the day, she discovered that her husband had been murdered, apparently during a burglary. The community mourned the loss of a great man. Two years later, an affordable housing complex on Exposition Boulevard as well as a nearby street and park were named in honor of Rolland Curtis. 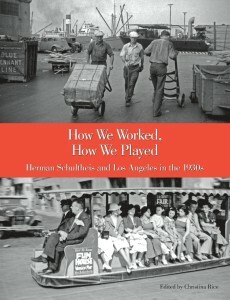 While serving as Field Deputy, Curtis took photographs that documented African-American life in Los Angeles during the 1960s and 70s, particularly in the political realm. 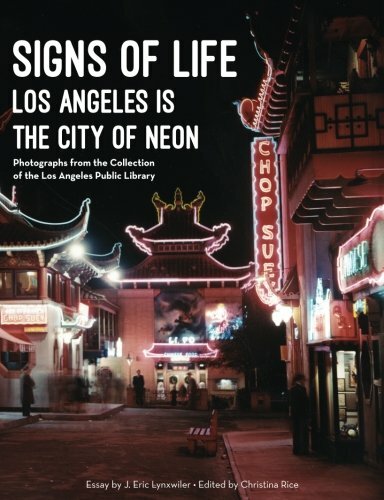 The Los Angeles Public Library is proud to feature the Rolland J. Curtis Photo Archive as part of its photo collection, and Photo Friends is proud to showcase Rolland Curtis’ talent during African American History Month (also known as African American Heritage Month). All of these photographs were taken by Rolland J. Curtis and are from the Rolland J. Curtis Collection of Negatives and Photographs. 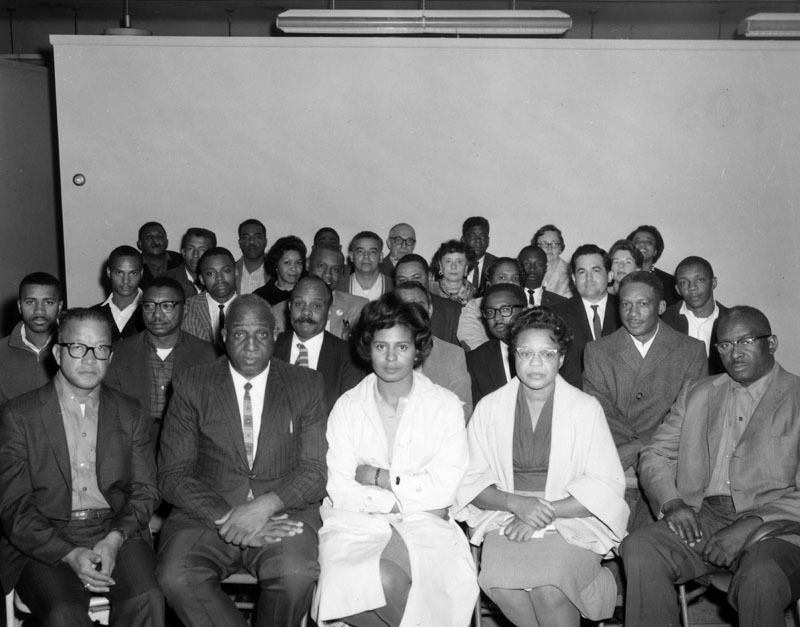 The Urban League of Los Angeles poses for a photo, with Perry Parks, its president, seated second from left in the front row. 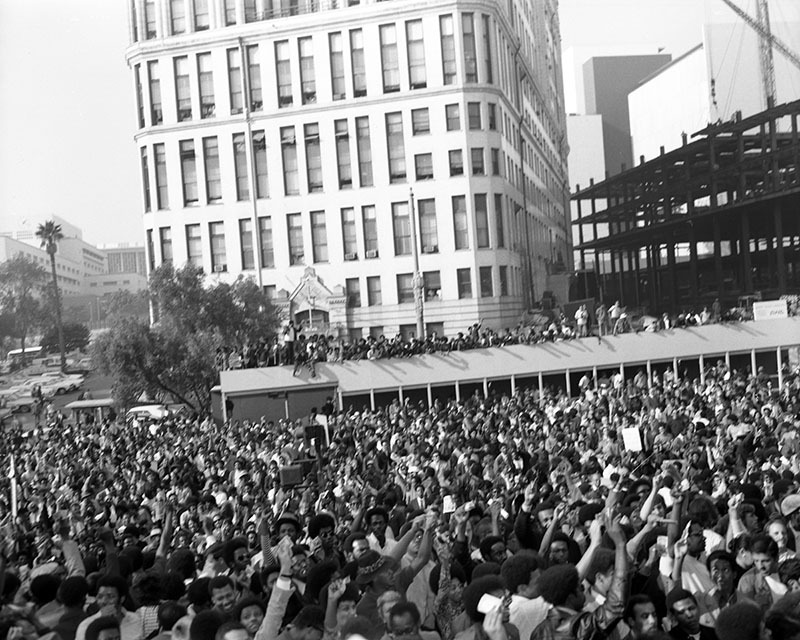 Thousands of demonstrators gathered downtown to protest the LAPD’s use of excessive force during a raid of the Black Panther Party’s headquarters in Los Angeles. 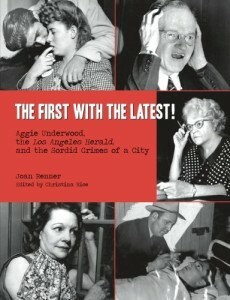 This protest underscored the poor relationship between the African-American community and the LAPD at the time. 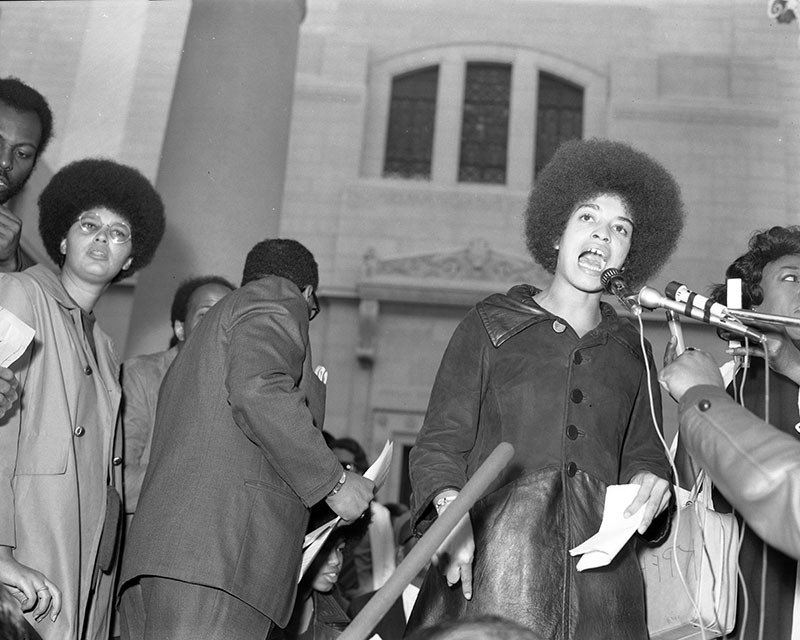 Political activist Angela Davis speaks at the protest. 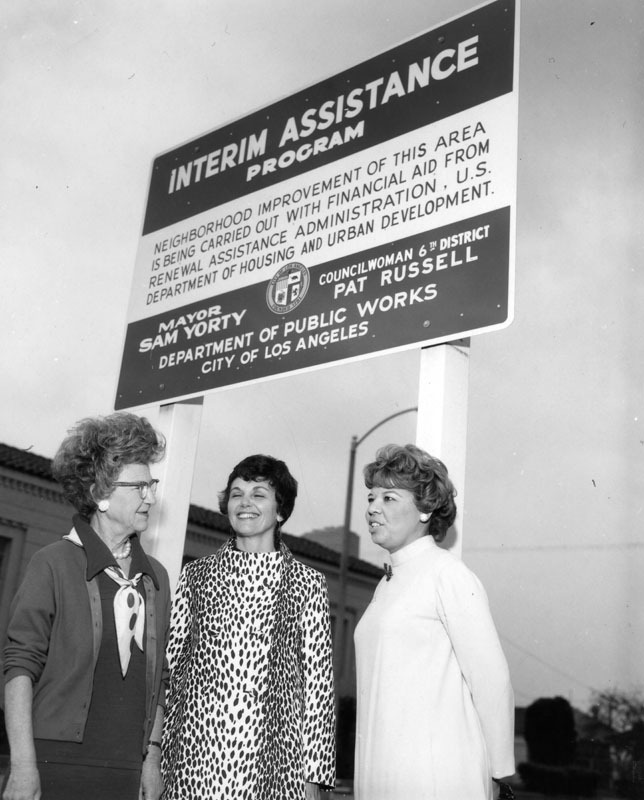 Councilwoman Pat Russell stands in the center of a group of women involved in the Interim Assistance program which used funds from the U. S. Department of Housing and Urban Development for neighborhood improvement. Councilman Billy Mills cuts a cake honoring the second year of operation for the Avalon Youth Opportunity Center which helped youths find employment and educational opportunities. 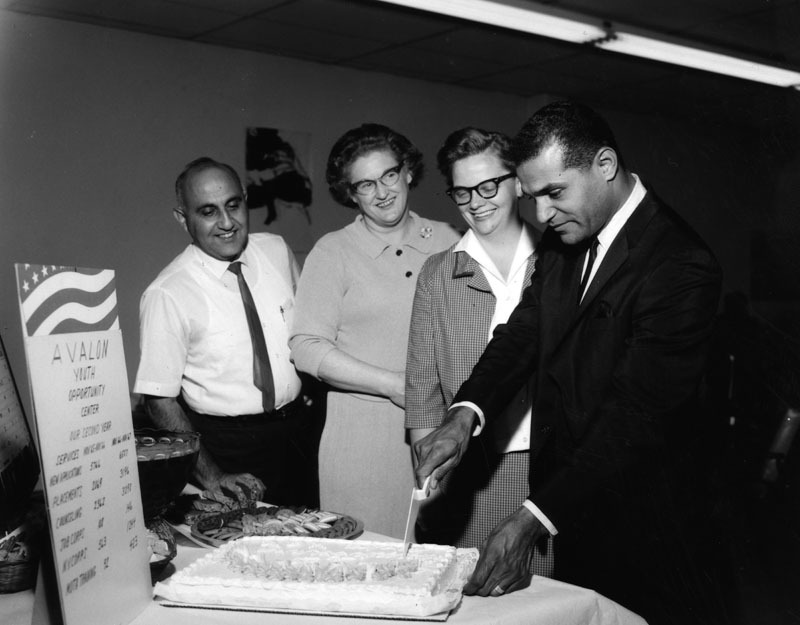 Center Director Harry Halbandian is at the far left. 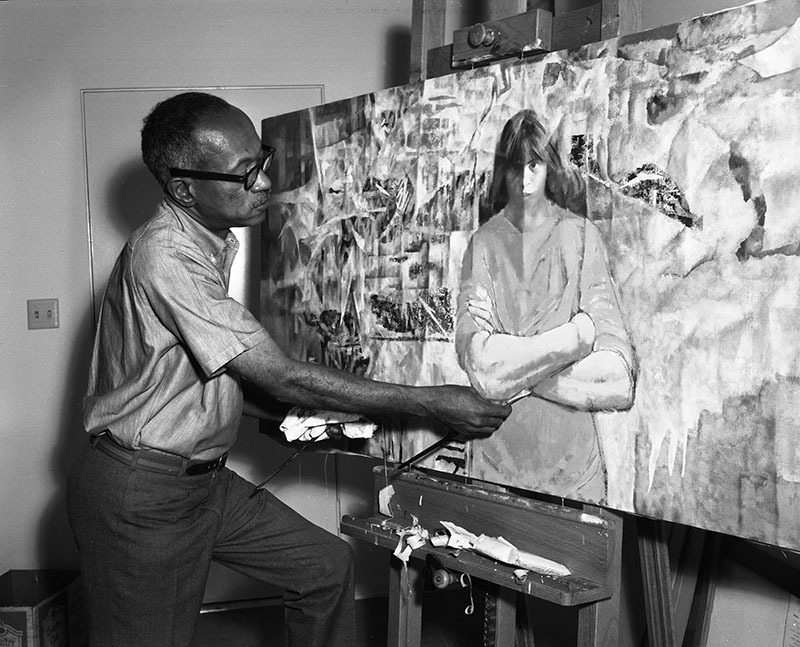 Curtis captures artist Charles White while painting at his home in Los Angeles. 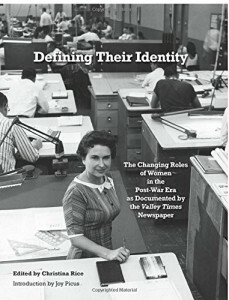 White was the third African American artist to become a full member of the National Academy of Design. 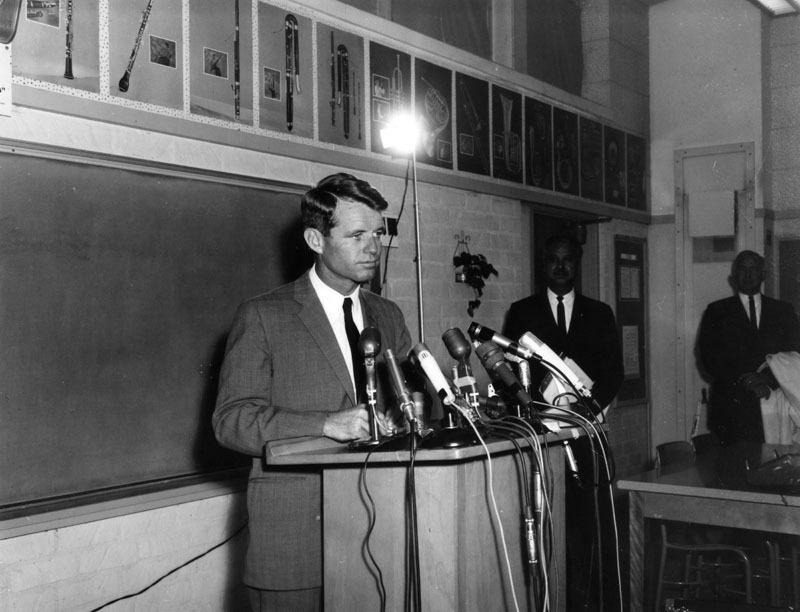 Attorney General Robert Kennedy, acting as chairman of the President’s Committee on Juvenile Delinquency and Youth Crime, speaks at Markham Junior High School in the Watts neighborhood. Standing nearby is Leon Aubry, Sr., longtime community activist and barbershop proprietor who was also known as “the mayor of Jefferson Boulevard”. 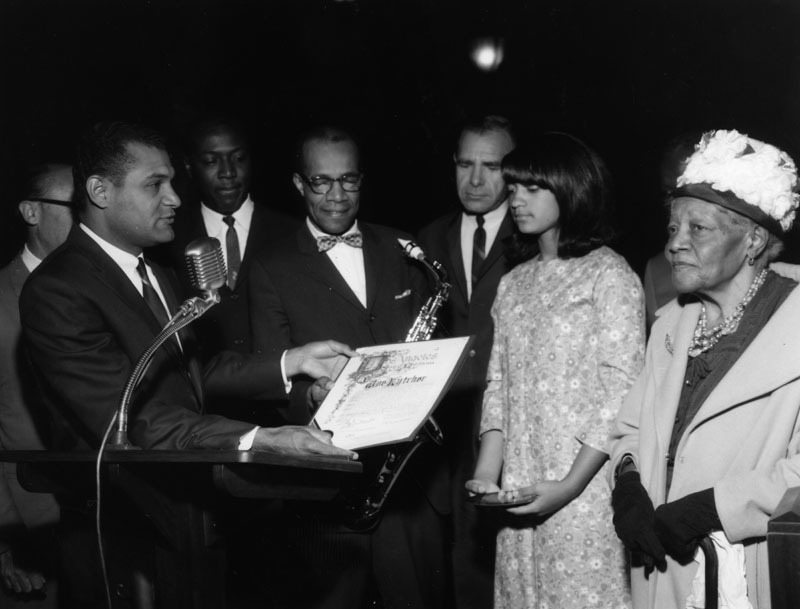 Supporters of Operation Breadbasket, an organization founded in 1962 to improve the economic conditions of African-American communities, gather to hear City Council member Billy Mills (at podium) and the Reverend H. Hartford Brookins of A.M.E. Church (at right holding paper) speak. 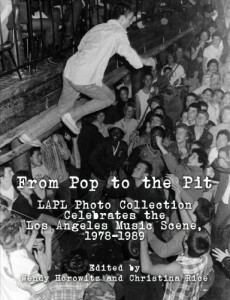 Jazz musician Joe Lutcher (who played saxophone and was bandleader for such notables as Sammy Davis, Jr., Nat King Cole, and the Mills Brothers) receives a Los Angeles City Council proclamation. Councilman Billy Mills presents the proclamation while Lutcher’s family watches. 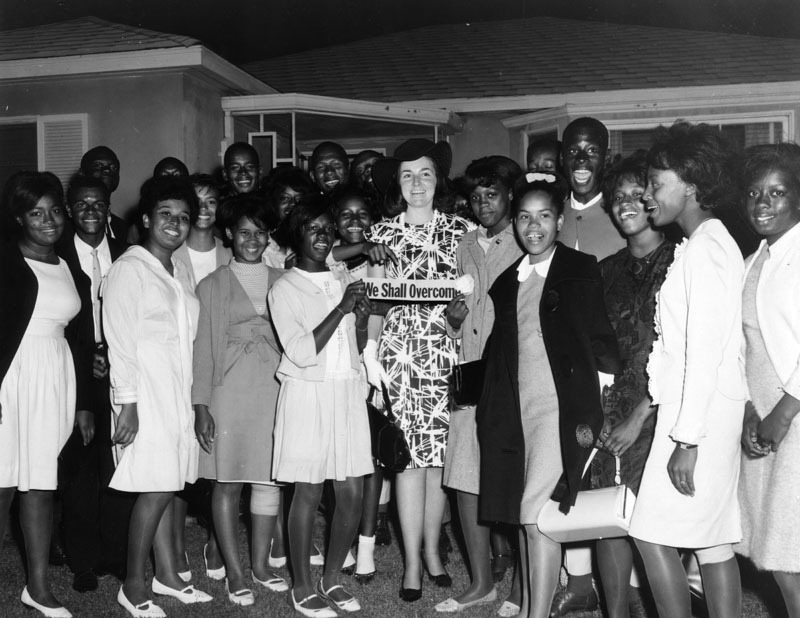 A youth group supports civil rights and equality for all. Joe Louis, world heavy-weight boxing champion, poses for Rolland Curtis’s camera. 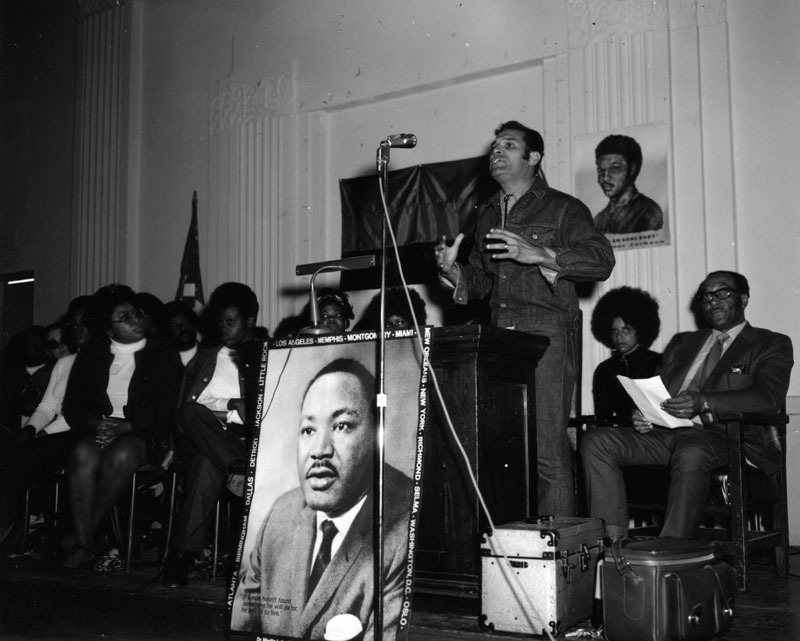 Martin Luther King, Jr. poses for Rolland Curtis at the Second Baptist Church, where King delivered a sermon to a standing-room-only crowd of 2,000 people. Reverend Thomas Kilgore, pastor of Second Baptist, is standing to the left of King. Photo taken in February, 1964. 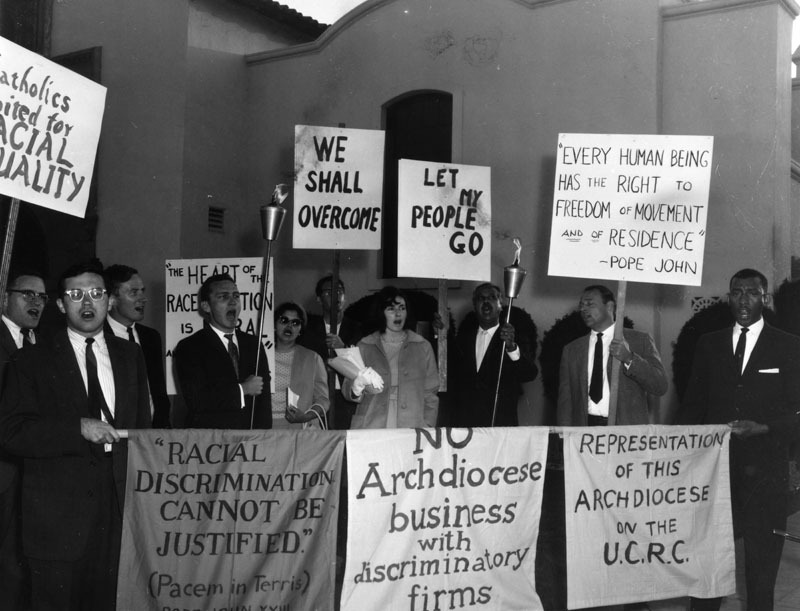 Catholics United for Racial Equality (CURE) protest discriminatory treatment of minorities by the Catholic Church. 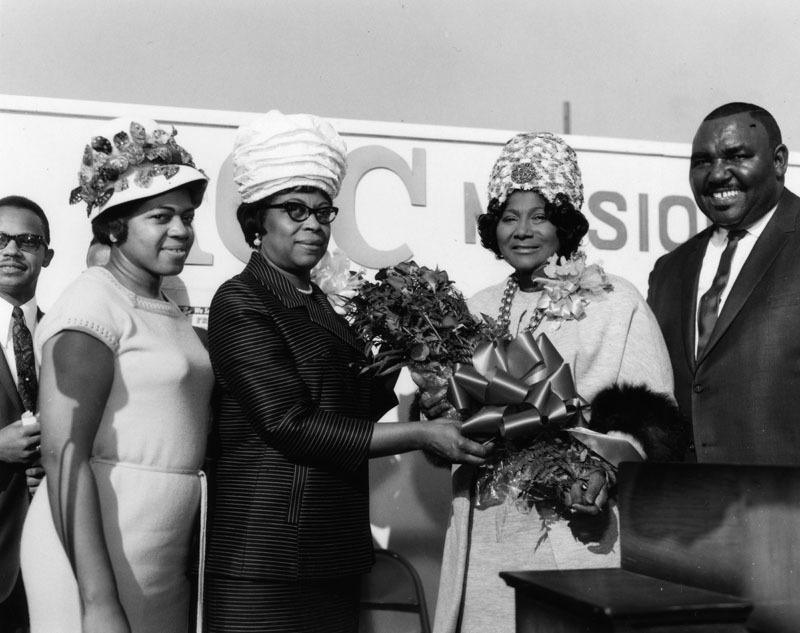 Gospel singer Mahalia Jackson (second person from the right) is presented a bouquet of flowers. 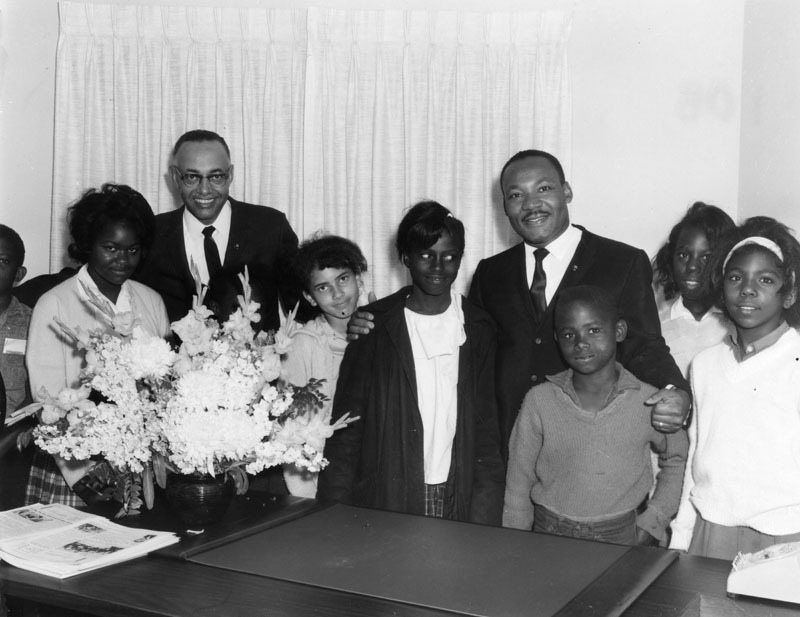 Reverend E. Boyd Ester, founder of Community Missionary Baptist Church, is at the far right of the photo. 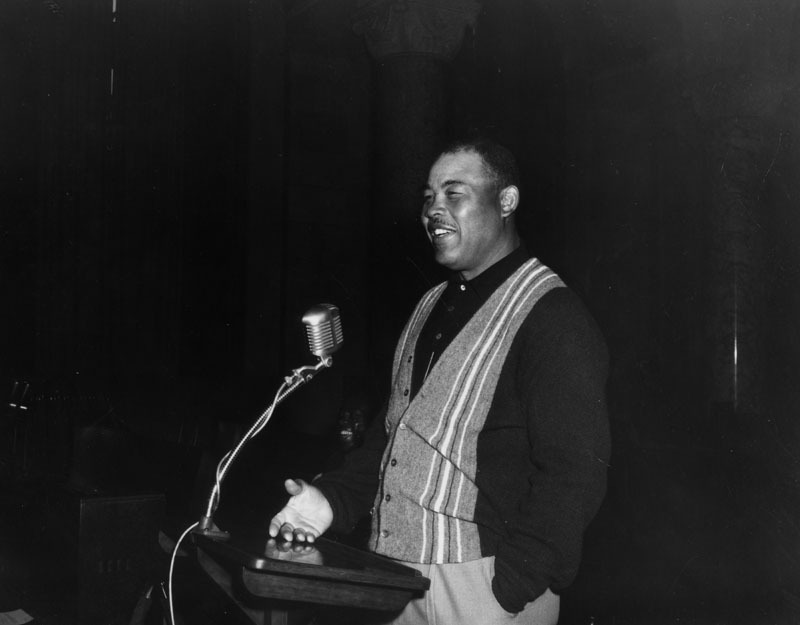 Wilson Riles was the first African American to be elected to a statewide office in California, serving three terms as California State Superintendent of Public Instruction. Born into poverty in rural Louisiana and orphaned at an early age, Riles attended high school in New Orleans (where he supported himself by delivering milk), received Bachelor’s and Master’s degrees from Northern Arizona University, and taught school in Arizona before relocating to Los Angeles. He became State Superintendent in a stunning defeat of Max Rafferty, a hardline back-to-basics educator who had held the office for eight years. Riles championed early education, parent participation in curriculum development, and special classes for disabled students. Here we see him campaigning with Tom Bradley outside of Magnificent Bros Hair Salon 2 in Watts. 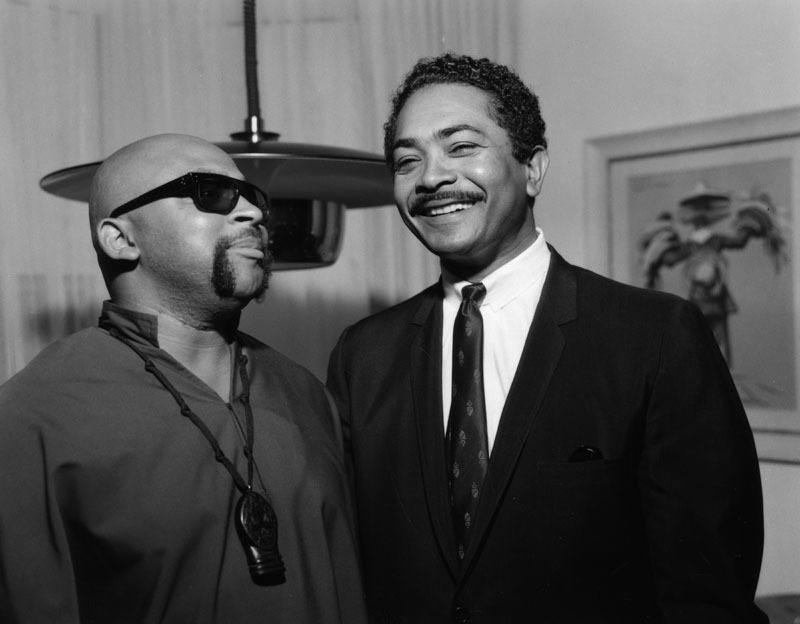 Activist and author Ron Karenga (on the left), the creator of Kwanza, meets with Assemblyman Mervyn Dymally, the first Trinidadian to serve California as State Senator and Lieutenant Governor. 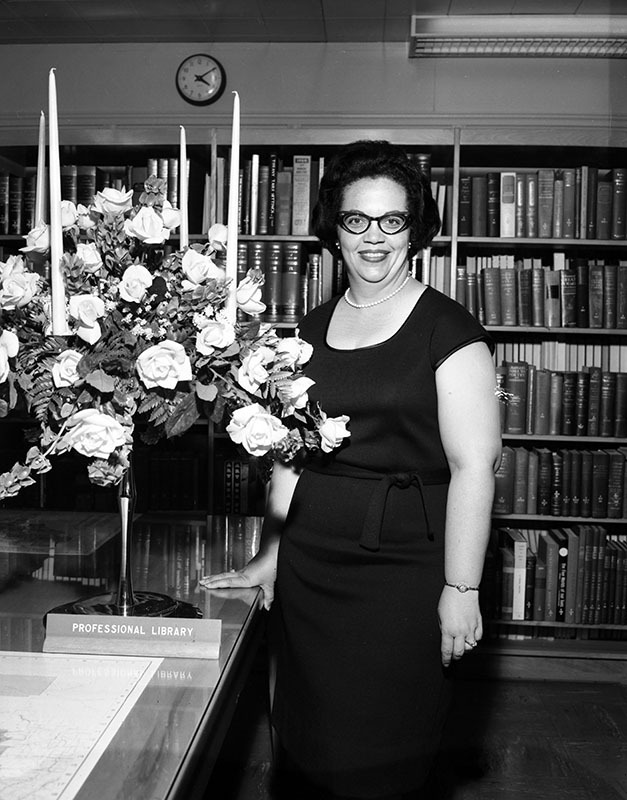 Gloria Curtis, wife of Rolland Curtis, worked in the field of education for 35 years, with over 20 of those years being dedicated to writing biographies of famous African Americans for school textbooks. 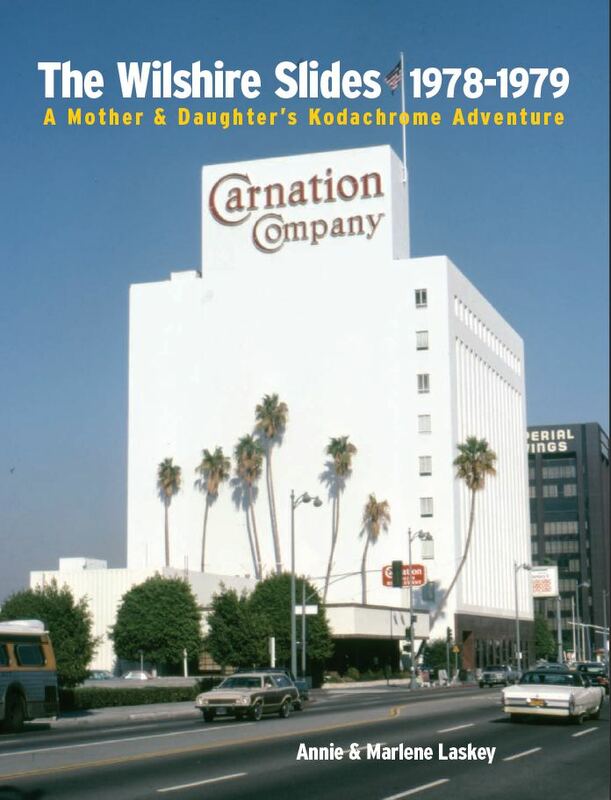 Due to Mrs. Curtis’s generosity, the Los Angeles Public Library is the proprietor of the Rolland J. Curtis Collection of Negatives and Photographs. 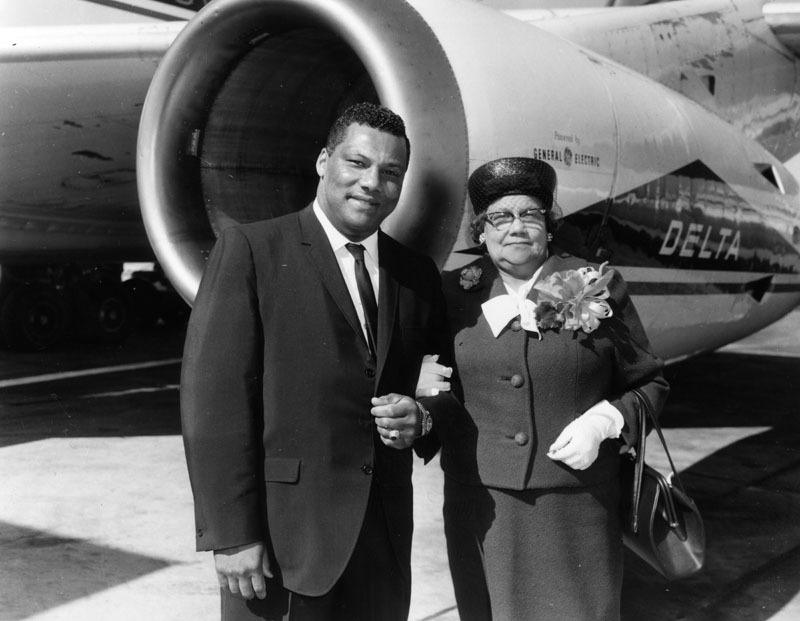 Rolland Curtis poses with his mother, Mathilda Curtis. Rolland Curtis was gregarious, generous, and always quick to smile. He was never one to deny financial assistance to someone in need. It was noted that his opening lines were never serious if he could make them comical. 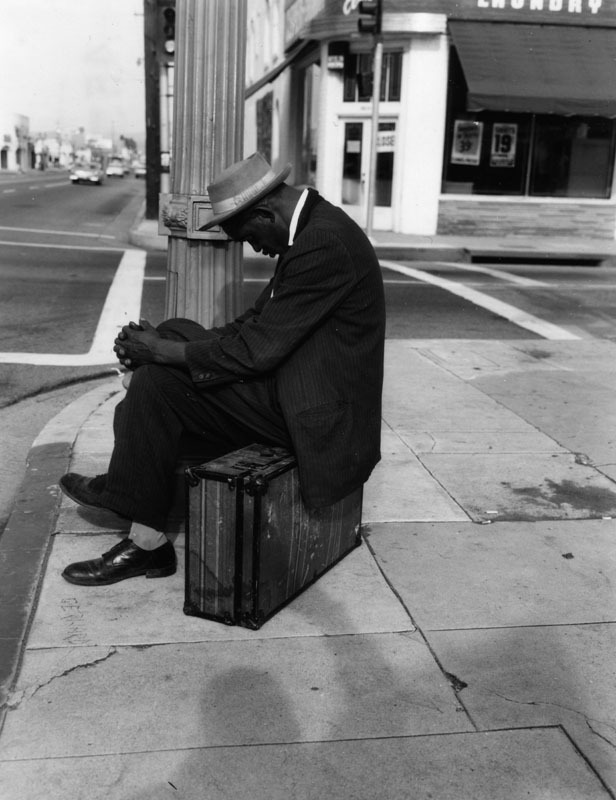 Here, Curtis captures a man napping while sitting on his suitcase. In spite of all the dignitaries he met and the historic events he attended, Rolland Curtis relished ordinary moments.